After this fabulous meal he departed, taking some of the chicken with him but leaving us with most of it, along with the carcass, which we immediately turned into stock. 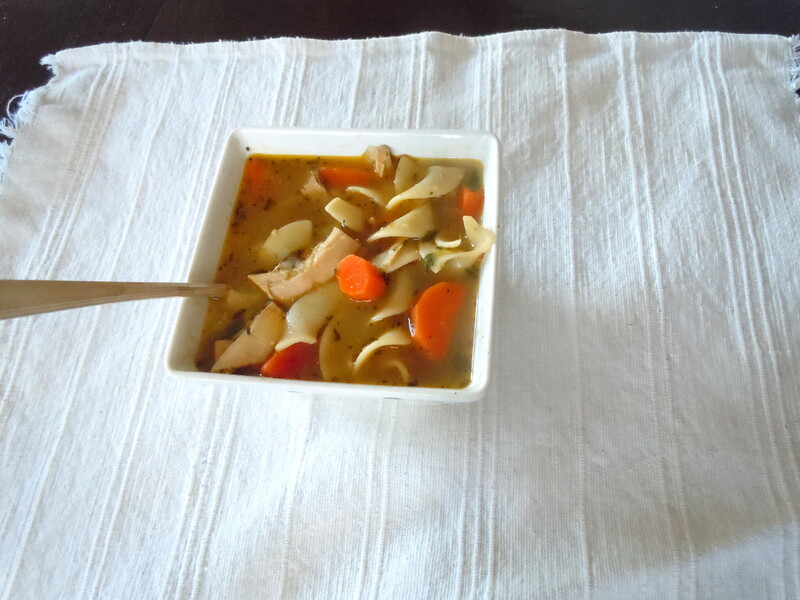 I make a lot of soup, but hadn’t made a classic chicken noodle version for years. 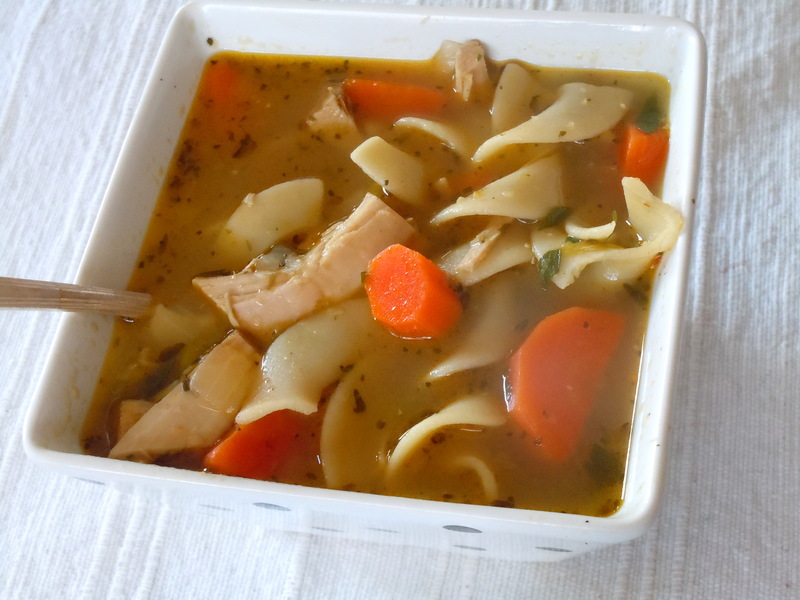 With fantastic ingredients like golden, aromatic stock and tender chicken, I wanted to keep it simple: celery, carrots, onion, egg noodles, and that gorgeous stock and chicken. Taste your stock first to see if it needs anything; mine needed reducing to intensify the flavor. Adding just a touch of lemon juice heightened the roasted chicken flavor without dominating; the parsley provides a fresh green note. I’m not one for a bowl of stock with a few noodles and an occasional bit of chicken, as you can tell from the photo. If you like more stock, add more than the recipe calls for. I served big bowls of the soup for dinner, with a warm loaf of No-Knead Cheddar Bread. Just the thing for a chilly evening. Warm the oil (or butter or fat) in a stockpot over medium heat. Add the onions and cook for a few minutes, until they’re translucent. Add the carrots, celery, garlic, and thyme; season lightly with salt and pepper. Cook, stirring now and then, for around 8 minutes, until the veg are becoming tender and aromatic. Add the stock and the lemon juice. Reduce the heat to medium-low and simmer for 30 to 45 minutes. (Or simmer on very low heat for as long as a few hours.) Taste and adjust the seasoning; if it’s a bit flat, add a few drops more lemon juice as well as some salt and pepper. When you’re less than half an hour away from eating the soup, add the chicken and noodles. Increase the heat to medium and cook until the noodles are just tender. Add the parsley and you’re good to go. This entry was posted in meat, poultry,and fish, pasta, rice, and grains, soups and tagged carrots, chicken, noodles, soup. Bookmark the permalink. Brett, we got a whole turkey for just the three of us with the express purpose of making soup. I’m thinking turkey-black bean. Happy Thanksgiving to you as well. How lucky were you to have a friend bring you an organic chicken. I just bought one and it was definitely an expenditure. Worth it, but expensive. I’m so glad you used the remains in this lovely soup! Thanks, Kristi, We certainly were lucky–Joe’s a great friend, and that chicken was fantastic.